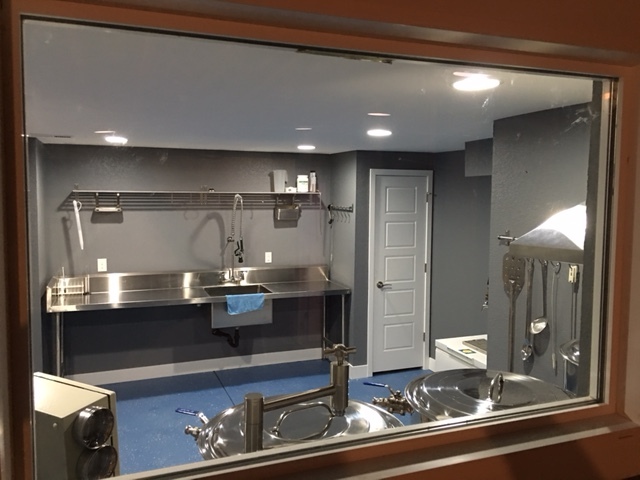 My 3 year vision of a basement space for all my brewing, storing, servings needs is complete! 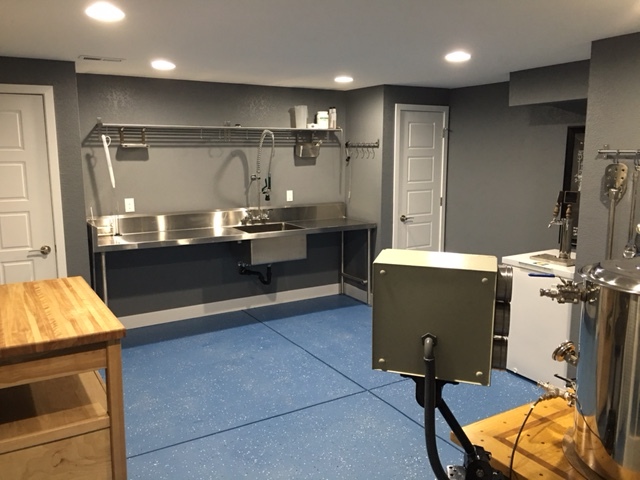 I originally purchased a turnkey electric setup that was built by a fellow forum member in Ohio. 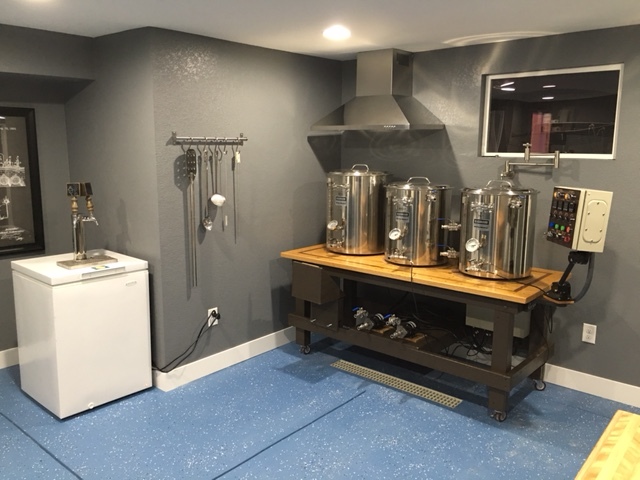 He built two electric brewing systems from the plans on this site (but modified the system to run back to back batches and separated the electric controls and power connections) with intentions of opening up a "learn to brew" store, but plans fell through. He was looking to sell when I was planning to source parts to build. I've been brewing in my garage in Denver Colorado for the last 3 years on the system but when we moved into a new home (with a large unfinished basement) I couldn't wait to build out a corner to brew in comfort year round! Hope you guys enjoy the pics. First brew session will be this weekend - My creation of an Electric Citra Grapefruit Pale Ale. Nice job Adam and thanks for sharing! As we discussed through emails, I've now added one of these pictures to our Testimonials page too. Cheers! Looks great Adam. Nicely done. Curious what your floors are? Is that epoxy? Yep, just epoxy with colored fleck over the existing concrete base! Off the hook layout. Really Nice!!! Mind sharing what attachment you're using to mount the control panel there? Link Posted: Wed Jul 20, 2016 3:56 pm Post subject: Awesome space~! out of all of it I really love that table. Whered you happen to find it? Sorry for the late reply. Have been busy brewing...just kidding. Too much work and family. Regarding the mount, I reached out to the guy who I bought the system from. He is pretty crafty and some of it is custom wood fabricated to the metal pieces, but when I hear back from him I will reply here! Link Posted: Tue Aug 30, 2016 9:27 pm Post subject: Re: Awesome space~! The guy I bought this from (he built out two with hopes of opening a learn to brew store) actually built the table from scratch including the custom inlay on the table top! Very nice job Adam, congrats !!! Link Posted: Sun Sep 04, 2016 3:59 pm Post subject: Re: Awesome space~! Directly from the builder of the table: "The tables are custom made by myself & a friend from white oak with walnut inlay(I really struggled with letting those go because they have some serious style points)"
Link Posted: Sat Jan 21, 2017 1:02 am Post subject: Wow! Nice setup Adam! If you don't mind sharing some info.....did you do the renovations on the room yourself or have a contractor do it? If you used somebody...would you mind sharing? I live very close and am looking to do something similar! Link Posted: Sat Jan 21, 2017 1:15 am Post subject: Re: Wow! Cheers! Let me know if you have any other questions. I see this is a older post but is that a floor drain in front of Kettles? Id like to know what went into that floor, thats a great look ? ?